Marine sticklebacks schooling. Courtesy of Anna Greenwood. The relative contributions of nature and nurture to behavior are a perennial source of dispute. That there is a genetic component is clear, but frustratingly, only a handful of specific genes are known to directly influence behavior in vertebrates. In the June issue of GENETICS, Greenwood et al. describe how they pinned down one of these elusive genes. 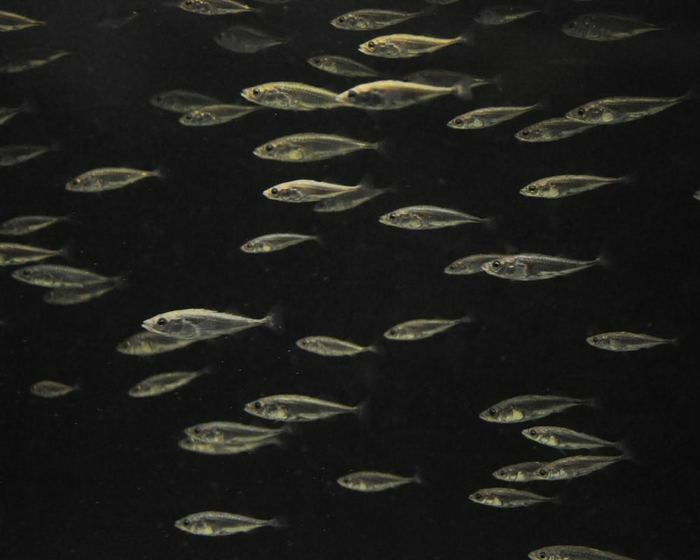 From their prior work, the researchers knew that in threespine stickleback fish, the ability and motivation to school—a complex behavior—is associated with variation in a few regions of the genome. One of those regions includes the gene Eda, which affects the development of sensory organs that the fish use to detect movement in the water near them. 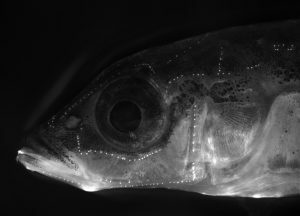 Sensing these vibrations is crucial for fishes’ ability to perceive other fishes’ swimming patterns, so the researchers wondered whether the Eda gene might also affect schooling behavior. A stickleback with sensory cells of the lateral line (neuromasts) stained. Courtesy of Abby Wark. To test this, the researchers took advantage of the fact that sticklebacks that live in the open water school more frequently and in a more coordinated fashion than do benthic sticklebacks, which live in highly vegetated habitats. Since the open-water sticklebacks express higher levels of Eda than do their benthic brethren, the researchers modified the genome of benthic sticklebacks so that they carried a continuously active Eda gene. The researchers needed an objective measure of schooling behaviors, so they used a unique assay previously developed in their lab. 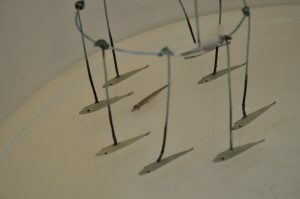 In the assay, a stickleback is placed in a tank with several robotic fish, and when the robots begin to move, the stickleback attempts to school with them. This allows the researchers to quantify both the fish’s willingness to school and its ability to maintain a body position parallel to the robots, which is a proxy for its schooling skill. A stickleback joins a school of robotic fish. Courtesy of Anna Greenwood. Using this assay, the researchers found that the transgenic sticklebacks’ schooling ability was more like that of the open-water sticklebacks, blowing the wild type benthic sticklebacks out of the water. The transgenic fishes’ willingness to join the model school was not affected, as measured by how long they took before beginning to swim in tandem with the robots. This suggests natural variants of Eda directly affect sticklebacks’ schooling behavior, making it one of the few genes of its kind known in vertebrates. Future research targeting the mechanisms of Eda and genes like it could uncover more clues about the genetic underpinnings of behavior. Greenwood, A.; Mills, M.; Wark, A.; Archambeault, S.; Peichel, C. Evolution of Schooling Behavior in Threespine Sticklebacks Is Shaped by the Eda Gene.